Week 5 of training threw some wrenches into my plan, that’s for sure! But I ended up making it work and fit in all my key workouts – even if they weren’t done when I originally planned them to be. I was so excited for this week because it was the first half of my winter break. I thought it would be so much easier to get my runs and strength training in since I didn’t have to work. And then I got sick on Monday. It seems like my body always waits until I’m relaxed and on a break to totally fall apart and get sick. I felt like I was hit by a truck. I quickly took some Zicam to stop the cold/flu/whatever it was in it’s tracks, and it did curb some of the symptoms, but I didn’t really feel right until Wednesday. Once I started feeling well again, family came into town for the holidays and craziness began. Needless to say, I had to get a bit creative and settle for an imperfect week of training, but that’s okay. It happens! Here is the overview of the week – what I had planned vs. what I actually did. And here is the detailed rundown! Monday: Rest Day. This one was planned. I started not feeling well toward the evening though. Tuesday: Rest Day. Woke up feeling like I was hit by a truck, so my planned speedwork was out of the question. I decided to take another rest day. Wednesday: Speedwork – 4 x 1600m w/ 800m recovery + WU/CD [7 miles total / 58:44]. This was ROUGH. I still wasn’t feeling 100% and it was raining and humid. Since it’s been dark and I’m not comfortable going to the secluded track by myself, I have been doing my speedwork in a shopping center that has a 1 mile loop and is well lit. It is usually totally empty, but on this day I had to dodge cars out shopping at 6 AM (did you know Kohls is open 24 hours until Christmas?). 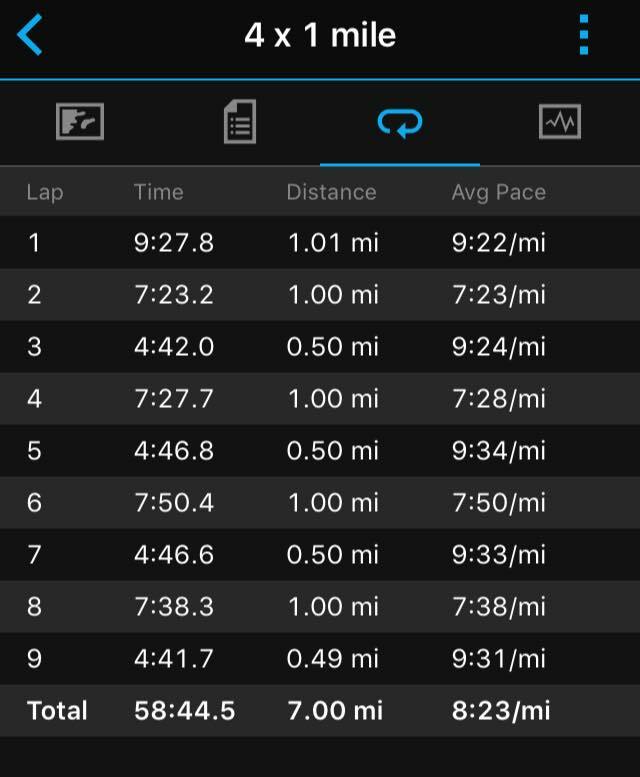 I’m not able to see my pace/splits until I’m done when I use the Garmin’s interval feature, and I couldn’t help feeling a little disappointed when they came up and only one was in my goal range, and they were WAY slower than they’ve ever been (Splits – 7:23, 7:28, 7:50, 7:38). But I tried to remind myself that my effort level was there and that is what was more important on this day. Plus I did 4 repeats instead of 3 for the first time, so that is something to celebrate! Like I said last week, the great thing about running is that there are no failures, just lessons learned for next time. It’s taken me a long time to realize that but it’s changed my whole perspective! Thursday: Easy Run – 4 miles / 35:45. I woke up on Thursday morning (Christmas Eve!) feeling much better. The weather has been crazy here in Virginia. It was 70 degrees, and it was so weird to go for a run in shorts and a tank top in late December! I went out to run 3 miles but felt great so I added another one, then I came home and foam rolled some giant knots out of my calves. Friday: Rest Day. 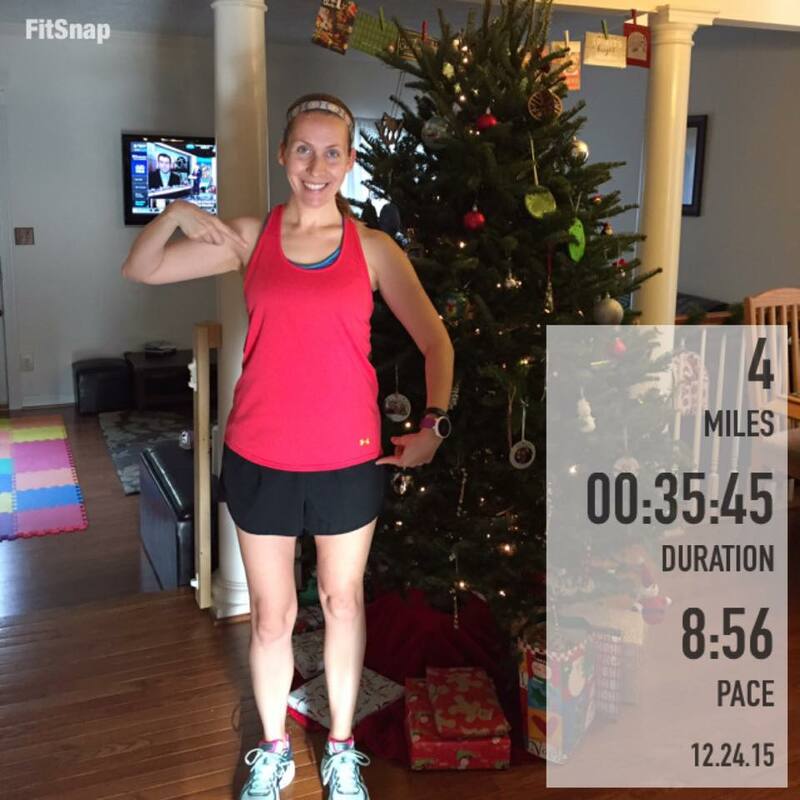 Technically I should have done my tempo run on this day, but it was Christmas and I knew it wasn’t going to happen. Instead I enjoyed the holiday with my family and our extended family who was at our house visiting, and I refused to allow myself to feel guilty for that! 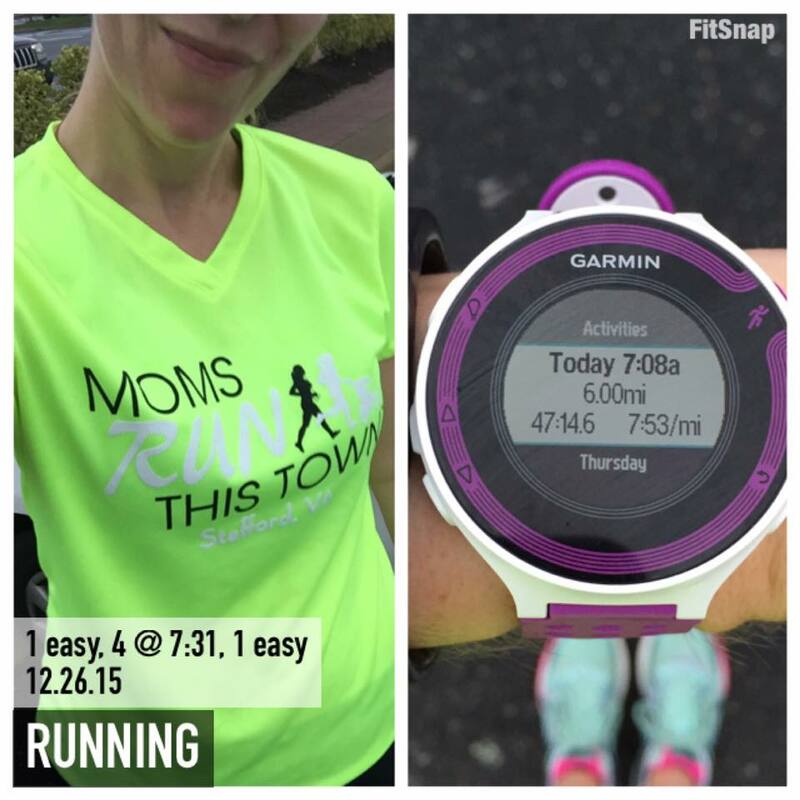 Saturday: Tempo Run – 1 easy, 4 @ tempo pace, 1 easy [6 miles total / 47:14]. 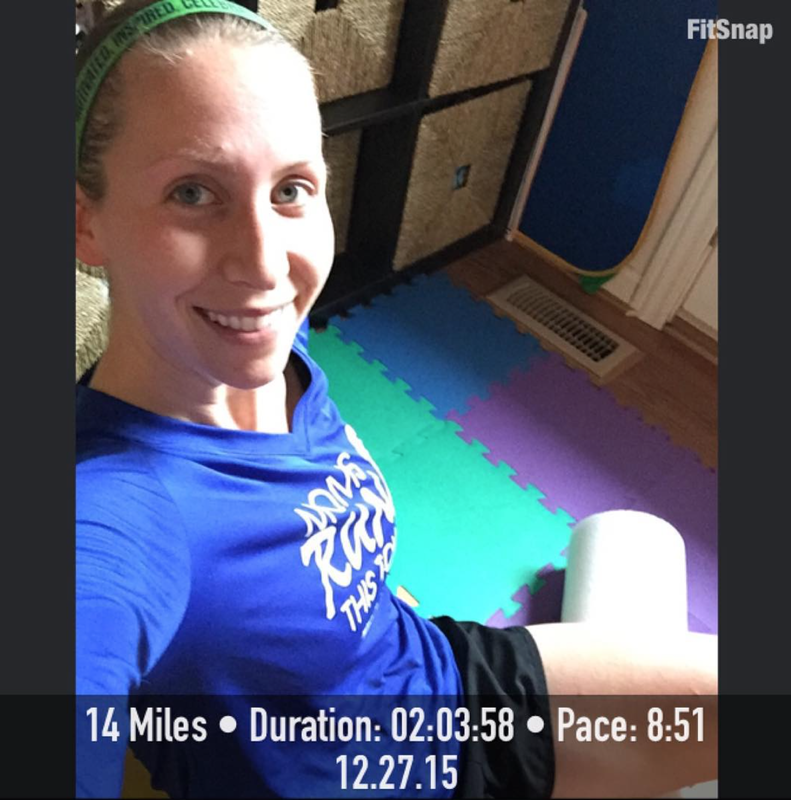 Because running the day after a holiday doesn’t hurt bad enough, why not make it a tempo run?! Haha! Surprisingly, this actually felt really good! The plan was to do 1 mile easy, 4 at tempo pace (7:32-7:45) and finish with 1 mile easy. I accidentally did my first ‘easy’ mile way faster than expected, but I honestly didn’t look at my watch until it beeped and was shocked to see a 7:48 split. I was a little worried that I went out too fast and wouldn’t be able to maintain my tempo pace for 4 more miles, but I continued to feel better and better with each mile that ticked by. I actually came in slightly below my goal range at 7:31 average pace for the middle miles! My splits for miles 2-5 were 7:34, 7:34, 7:29, 7:28. So much better than my speed work on Wednesday and it really restored my confidence. Sunday: Long Run – 14 miles / 2:03:58. I normally don’t do two harder efforts like a tempo run and long run back-to-back but didn’t really have a choice this week with the holidays, family in town, and my sickness earlier in the week. I wanted to do a few fast-finish long runs in this training cycle because I always struggle at the end of longer races, and practicing finishing strong should help with that both mentally and physically. I ran 14 miles total and my last two miles were 8:34 and 7:58! I also fought off two loose and aggressive dogs on this run, which was a little scary and got my adrenaline pumping. It also reminded me why I need to always run with pepper spray! Strength Training/Cross Training: None. Bad runner 😦 Lots of stretching and foam rolling though. My successes were managing to fit in all my key workouts, and having a very successful tempo run and fast finish long run. My body is feeling good now, and I’m proud of myself for getting into the habit of stretching and foam rolling after each run. My challenges were definitely the sickness that hit me and the busyness of the week that put my strength training on the back burner. My goal for next week is to make sure to get my strength training in – and to go into my longest distance in almost two years (16 miles! Eek!) with confidence! The thought of the week. When training gets hard, I need to remember this. It’s supposed to be FUN and it is with the right attitude! I am ready to finish out 2015 strong! 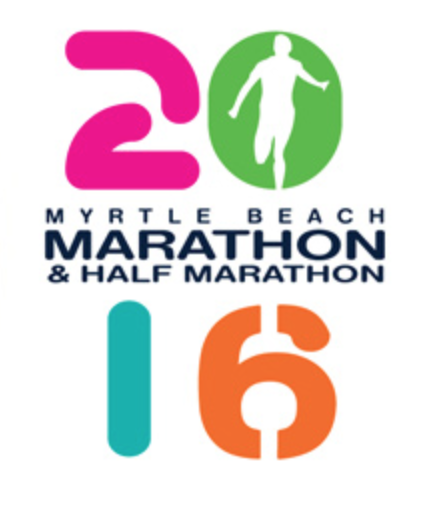 This entry was posted in Uncategorized and tagged In Training, Running, Weekly Run Down. Bookmark the permalink.